UEM Land Holdings Bhd, a property developer, said second quarter net profit jumped more than sixfold to RM40.3 million, mainly due to gains from its disposal of Touch 'n Go Sdn Bhd. The company made a gain of RM25.6 million from selling its 20 per cent stake in Touch 'n Go to PLUS Expressway Bhd for RM33.4 million. The disposal was completed in June this year. During the quarter ended June 30 2010, the company's revenue grew by 28 per cent to RM88 million, partly driven by higher sales of its industrial land in the Southern Industrial Logistic Clusters. 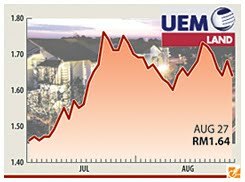 UEM Land believes it is able to achieve its headline key performance indicators (KPIs) set for this year, which includes an annual revenue growth of 35 per cent and return on equity of 6 per cent, backed by improvement in the property market. "The group is confident that the property market will continue its recovery in line with the encouraging gross domestic product (GDP) growth achieved by the country for the first half of 2010. "The property market in Johor generally, and Iskandar Malaysia specifically is expected to further benefit from the recent increase in interest from Singapore. "We expect the group to benefit from this positive sentiment and will continue to launch new residential projects in Nusajaya, as well as launching new phases of our existing residential projects in Nusajaya and Cyberjaya in the coming months. "The Group will continue to evaluate opportunities to acquire strategic land parcels outside Nusajaya to expand and grow our business to create sustainable return on investment for our shareholders," it said in a Bursa Malaysia filing yesterday. The company's share price on Bursa Malaysia declined 4 sen, or 2.38 per cent, to RM1.64.